Tomorrow "Sport Shooting Ambassador Award" winner Antonin Scalia will hear oral arguments in McDonald v. Chicago, a case that will decide whether the opinion penned by the gun industry "Ambassador" in District of Columbia v. Heller will be applied across the nation. Tuesday's oral arguments will be a homecoming of sorts for Scalia and Alan Gottlieb, whose Second Amendment Foundation is one of the driving forces behind the McDonald case (Gottlieb himself is an object lesson in the gun lobby's immunity to irony. The SAF head is a convicted felon -- he was caught cheating on his taxes -- who at one time lost the ability to possess guns. He later regained the ability to own guns through the now-defunct federal "relief from disability" program, a multi-million dollar program that re-armed convicted, often violent, felons, at taxpayer expense. The program was defunded after being exposed by my organization, the Violence Policy Center. When last seen together (at least by me), the two graced the cover of The New Gun Week in an article celebrating the ambassadorship bestowed on Scalia by the World Forum on the Future of Sport Shooting Activities (WFSA), an international organization comprised primarily of gunmakers and pro-gun organizations (including the National Rifle Association and the Second Amendment Foundation) from around the world. 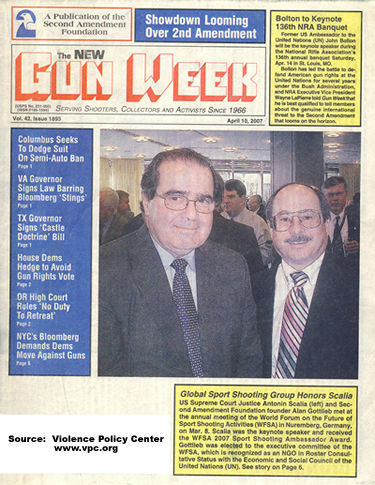 The award given to Scalia by the WFSA's "Image Sub-Committee" offers "public recognition of the social contribution made by some of the many public figures who have a longstanding interest in the shooting sports." Scalia was awarded the honor and gave the keynote address during the WFSA's 2007 annual meeting in Nuremberg, Germany. The previous year's winner was Ugo Gussalli Beretta, president of the Italian gun manufacturer Beretta. The award consists of a silver reproduction of a 16th century pistol with powder flask. While the WFSA Web site has photos and comments from prior "WFSA Ambassadors," Scalia can't be found -- and a photo appears to be overlayed where his own photo would be on the web page of past winners.